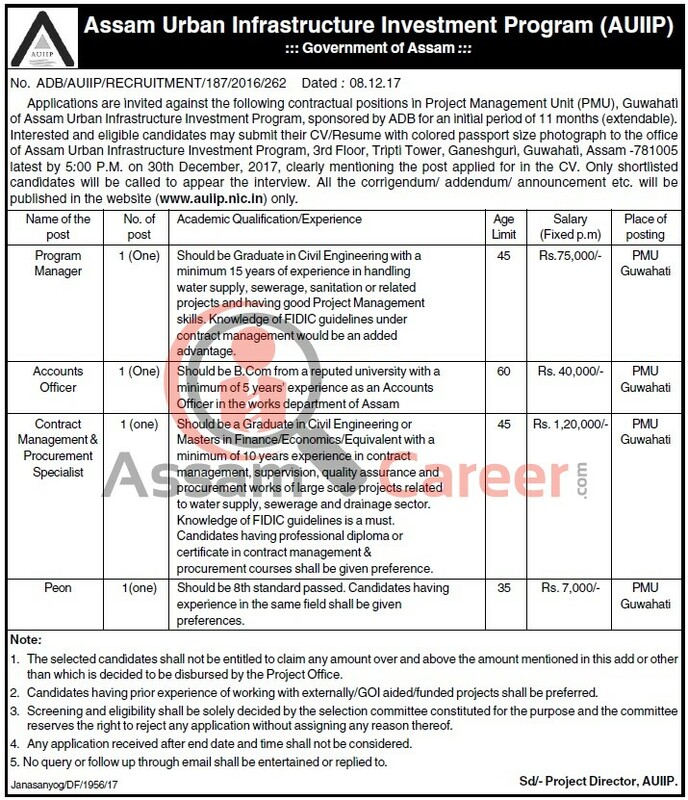 Applications are invited against the following contractual positions in Project Management Unit (PMU), Guwahati of Assam Urban Infrastructure Investment Program, sponsored by ADB for an initial period of 11 months (extendable). Educational Qualification: Should be a Graduate in Civil Engineering or Masters in Finance/Economics/Equivalent with a minimum of 10 years experience in contract management, supervision, quality assurance and procurement works of large scale projects related to water supply, sewerage and drainage sector. Knowledge of FIDIC guidelines is a must. Candidates having professional diploma or certificate in contract management & procurement courses shall be given preference. Educational Qualification: Should be 8th standard passed. Candidates having experience in the same field shall be given preferences. How to apply: Interested and eligible candidates may submit their CV/Resume with colored passport size photograph to the office of Assam Urban Infrastructure Investment Program, 3rd Floor, Tripti Tower, Ganeshguri, Guwahati, Assam -781005 latest by 5:00 P.M. on 30th December, 2017, clearly mentioning the post applied for in the CV. Only shortlisted candidates will be called to appear the interview. All the corrigendum/ addendum/ announcement etc. will be published in the website (www.auiip.nic.in) only. Last date is extended for Program Manager and Contract Management & Procurement Specialist till 16th Jan'2018. Advertisement Details: Pl check here.and here .